Magneti Marelli, through its “Magneti Marelli Powertrain India Private Ltd.” joint venture (JV between Magneti Marelli, Maruti Suzuki and Suzuki Motor Company in force since 2007), recently inaugurated a new industrial site for the production of robotized gearboxes for automobiles, also called AMT (Automated Manual Transmission). The plant is located in Manesar, near Gurgaon, just a few kilometres from New Delhi, in the same area that is home to the manufacturing facility dedicated to the production of powertrain electronic control units. The new plant covers a total surface area of 7,500 square metres, which houses the production lines and offices. When fully operational, the plant will employ approximately 115 people and will have a production capacity of 280,000 robotized gearbox kits per year. The facility was created to address the growing market success that the AMT component has had in India over the past two years and to meet the demand from local carmakers regarding additional future implementations. Examples of successful car models currently equipped with the Magneti Marelli AMT gearbox in India include Maruti Celerio, Maruti Alto, Tata Nano and Tata Zest. The reason behind the success of the AMT on the Indian market is due to the particularly positive perception on the part of customers and end consumers with respect to the specific and distinctive characteristics of the solution. In fact, the AMT is an example of a value-added yet cost effective technological solution which, automating a simple manual transmission with an electro-hydraulic “add-on” device, combines driving comfort, optimisation of fuel consumption and emissions, as well as containment of industrial costs. The technology is based on the use of an electronic control unit combined with an electro-hydraulic system that controls the use of the clutch when changing gears, allowing the driver to shift gears without the use of the clutch, either sequentially or in a fully automatic way. The electronic optimisation of the ATM gearbox also leads to reduced fuel consumption and CO2 emissions compared to vehicles with standard automatic and manual transmissions. The production facility in Manesar dedicated to the AMT component relies on advanced production systems and was built with a strong focus on respect for the environment. The main building, in fact, has been designed to facilitate the maximum diffusion of natural light during the day without the use of artificial lighting, while at night light will be ensured thanks to the use of solar panels powering low energy consumption LED light bulbs. Moreover, the exterior design minimises wind pressure, improving the internal ventilation. Finally, the building is equipped with a system for the collection of rain water and for waste management. 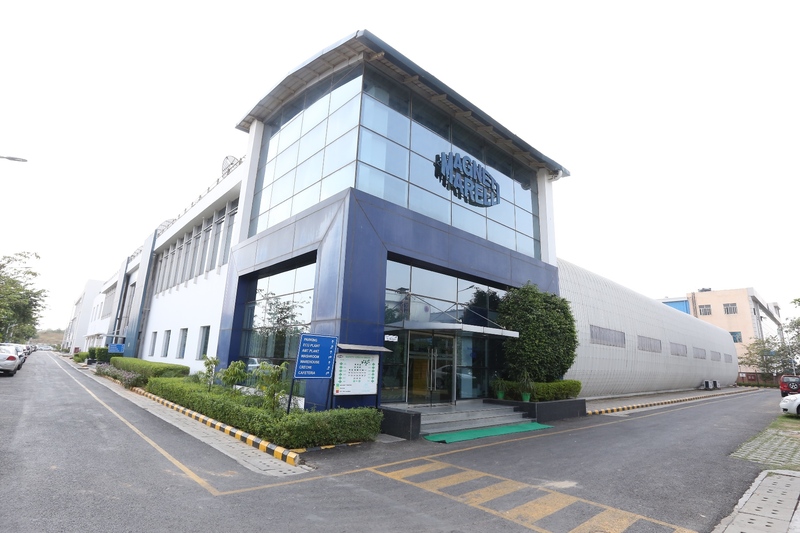 With the inauguration of this new facility in the New Delhi area, Magneti Marelli expands its presence in India. The full Magneti Marelli industrial perimeter is present in the country, with seven plants and a research and development centre in the New Delhi area, operating in the Powertrain, Electronic Systems, Exhaust Systems and Suspension Systems sectors; three plants and a research and development centre in the Pune area operating in the Lighting, Powertrain, Exhaust Systems and Shock Absorbers sectors; and a plant in the Chennai area, operating in the Exhaust Systems sector.